I had to take a quick peek into the kiln (as it was cooling) and got this picture of the top layer of pots. These pots were made by potter Fred Sweet at our studio. He used some new slip colors that we tested and plan to make in large containers for studio use. The beautiful brown pot in the background was actually painted with a deep black slip that reacts to the zinc in the clear glaze to cause this brown effect. We now use this slip/glaze combination to make our browns because the color is so rich! The bowl in the foreground was made by Connie Kregel and has a Rutile glaze with a pie-shaped area stained in iron oxide and covered with clear slip. This looks like a great website to support artists. Am still looking through all the neat components of this website, but they offer a place to sell your artwork, set up your own website, and post blogs. I think I have spent a hundred hours investigating shopping carts, credit card authorization software, and credit card machines. The prices are expensive and tough on a small business that does a few credit card transactions but normally relies on cash or check payments. But I wanted to add a shopping cart to our website and investigated dozens of companies that offer shopping carts. The biggest list of shopping cart companies that work with Paypal can be found on the PayPal website. In the end, I installed the basic PayPal cart because it offered a cost effective solution for my small website. The code was easy to generate and plug in to the website. You don’t need to know html (it helps to know a little) and I had all the buttons installed in about 2 hours. For “onsite” sales, at shows for instance, I can take my credit card swipe machine and make a paper copy of the credit card transaction and run it through the paypal Virtual Terminal at night. This will be fine for the foreseeable future but I can see where doing many dozens of transactions will squish this program. In order to have the Virtual Terminal, you must sign up for a business acct with Paypal and that is 30.00 / month. I expect to do at least a few hundred dollars / month in credit card sales so this fee is nominal for me. As the website grows, and as sales grow, I may have to reconsider the shopping cart and onsite sales tools. Have purchased a copy of the Coffee Cup shopping cart and am playing around with that. Will post results of that effort later on. In the meantime, we are now set up to take credit cards online and in person, and I’m hoping that will increase our sales. These 2 pictures show some of the colors using slips rather than glazes. 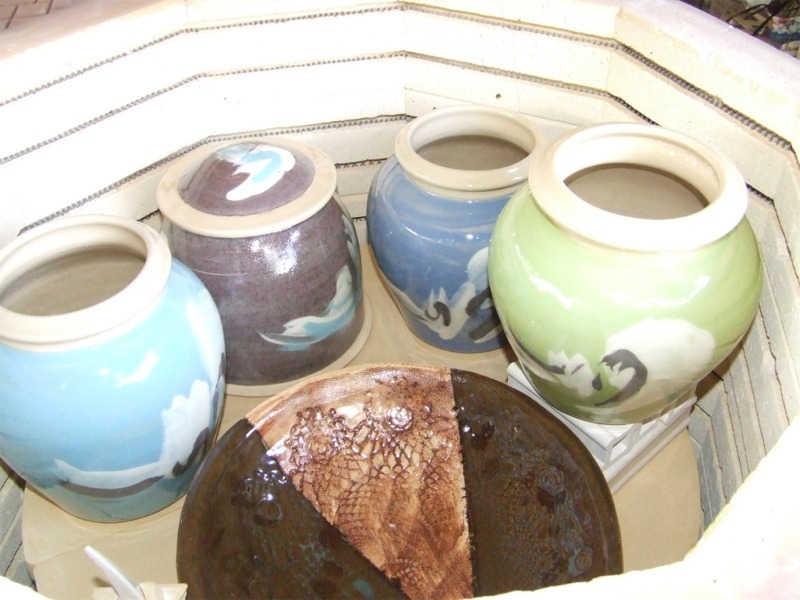 The covered dishes are purple, blue, white and green and will be much brighter once they have been glazed with clear glaze and fired to high temperatures. They are “painted” with colored slips while still leather-hard which is more time consuming than just dipping them in glazes after they have been bisque fired. The difference is, we can play around with the slips and make color changes that we couldn’t do if we just glazed the pieces. The candlesticks have already been hi-fired and the “Flag” candlesticks were colored with clay slips and then clear-glazed. The rutile-blue candlesticks were glazed that color from bisque, and the white candlesticks have a white gloss glaze coving them. Using colored slips in a studio adds flexibility to the pottery designs but adds some difficulty too. Colored slips get onto everything and can contaminate the working area so it is imperative that all tools, bats, ware-boards and working surfaces are constantly cleaned. Otherwise, you find yourself trying to make solid white pieces that end up having smears of other colors rubbed into the surface. Frustrating. I find myself spending an hour or 2 each day cleaning the studio. Eventually, I’ll have to weigh the value that colored slips add to the clay pieces vs. the labor hours I spend trying to keep everything spotless. If the studio was large enough, we could have a “green” area, “blue” area, etc. But we’re working in a rather cramped environment that is full of shelving and tables with little room to spread out.